Instagram used to be an app that was meant for sharing pictures. However, ever since it was acquired by Facebook it started to become more about communication, though the focus remained on pictures and other forms of visual communication. The launch of DMs on Instagram made the platform a lot better at helping people stay in touch with one another, and it seems like Instagram is expanding even further. This is because of the fact that it has now added a voice messaging feature to its DMs. "Starting today, you can send voice messages in Direct. Talk the way you want to be heard, whether by whispering what you’re up to or shouting a compliment. ", announced Instagram in a tweet. Instagram’s direct messaging feature used to be kind of a dull place. It was definitely not anyone’s first choice when it came to instant messaging, with other Facebook properties such as Messenger and WhatsApp being much preferred in these situations. However, the addition of voice messaging is definitely going to make Instagram feel like a more viable messaging options. Related: Can Small business owners make it big with Instagram? Sending a voice message is similar to the functionality we have already seen on WhatsApp and Messenger. You will see the image of a mic in the corner of the bar in which you type your messages out. If you wish to send a message, you will have to hold the mic button down and record your message while you do so. 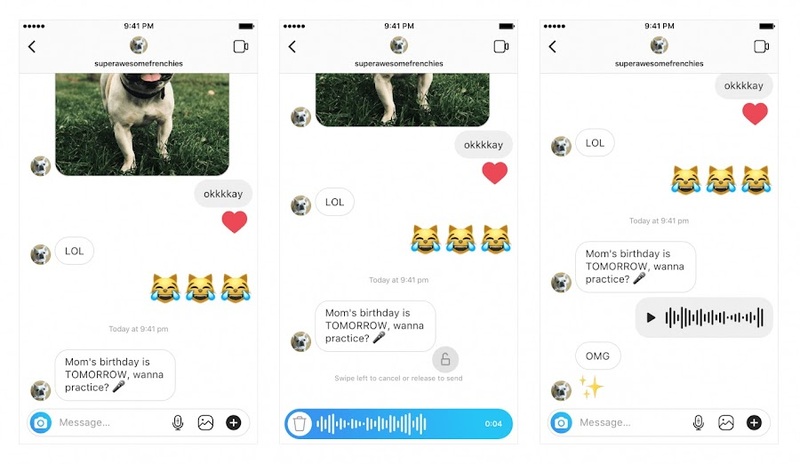 Currently you can only send messages that are a minute long, so Instagram’s voice messaging is not going to surpass the feature offered by WhatsApp any time soon. Some people are saying that this feature finally puts Instagram on par with apps like Messenger, but a lot of people are also saying that the feature is unnecessary and that Instagram does not need so many Facebook-esque features. The more cluttered Instagram gets the less efficient it will be at doing what people actually want it to do.